Is the geology suited for drilling, which drilling method is preferred? Are there any environmental or groundwater issues to be considered? Is there sufficient area for the borehole heat exchanger system? What are the expected soil thermal properties? Is the building energy demand suitable for a GSHP system? What are the expected savings on energy? Is a Geothermal Response Test recommended? What is the first-order size of the proposed borehole heat exchanger system? 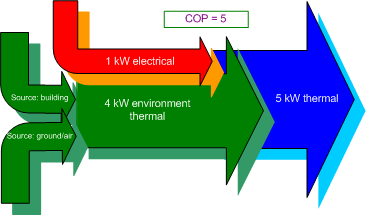 The feasibility study is the first step in the realization of a ground source heat pump installation and it will allow the client to come to a clear and documented decision with regard to the suitability of the technology for their project and whether it has the capability of meeting long term energy saving goals. 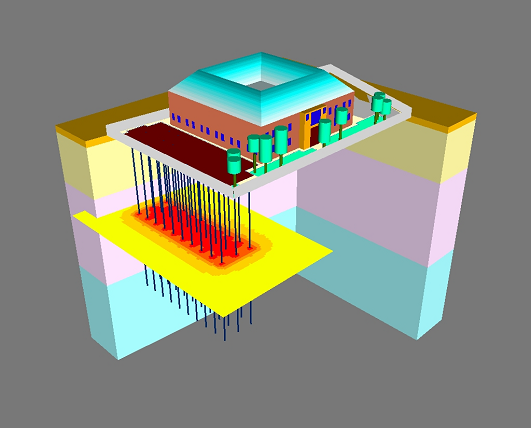 Depending on the complexity of the building energy requirements or the wish to reduce possible risks associated with the implementation of groundsource, such as the installation of heatexchangers under a building, a feasibilty design study can be followed by a full-fledged design study and possibly include a Geothermal Response Test and the test drilling of a borehole on site. Borehole heat exchanger systems provide heat pump installations operating conditions that will allow them to heat & cool the building much more efficiently then with a traditional heating and cooling installation. The energy saving is possible as, for every kW of work (electrical energy) 4 - 5 kW of thermal energy is transferred. The thermal output is therefore much greater than the energy input, the extra thermal energy (heat) is taken from the environment. At the hart of a geo-energy system we find the heatpump. 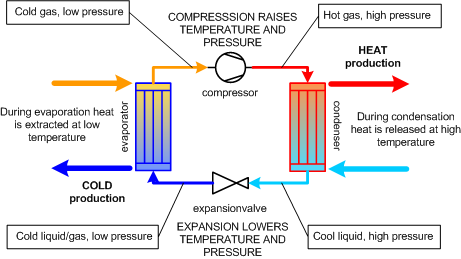 Most heatpumps operate according to the principle of a gas-compression cycle. A refrigerator, for example, is a heatpump and is built of the same components: a compressor, a condensor (the grate on the back of the fridge that is warm) and an evaporator (located inside the fridge, the part that gets cold). Moreover, there is an expansion valve present. The heatpump contains a special gas/liquid (the refrigerant or working fluid). In the evaporator the temperature of the refrigerant is lower than the surrounding space, here the refrigerant will take up heat from the surroundings and evaporate. The gas is subsequently compressed in the compressor, increasing both pressure and temperature. 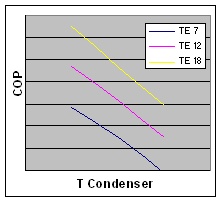 In the condensor the heat is transferred to the colder surrounding, the refrigerant cools down and condenses. The liquid refrigerant, still at high pressure, passes the expansion valve where the pressure is lowered to a level where the mixture evaporates to gas. This process is accompanied by a marked lowering of temperature. The heatpump uses the fact that the phase changes (evaporation and condensation) involve the exchange of large quantities of thermal energy, together with the fact that the temperature at which the working fluid evaporates or condenses is pressure dependent. A heatpump literally pumps heat from a low to a high temperature level. A small quantity of electrical energy is needed to drive the compressor, the thermal energy is taken from the environment. More thermal energy is released than electrical energy used: the system has a very high efficiency. We mentioned the surrounding temperature, for the evaporator and condensor, a few times. These surroundings are, in a closed loop geo-energy system, the ground and the building. When we heat the building the evaporator is connected to the ground (heat is extracted from the ground). During mechanical cooling the condensor is coupled to the ground and the evaporator to the building: heat is absorbed from the building and transferred to the ground. The efficiency of a heatpump is defined as it's COP (Coefficient of Performance). This COP depends on the design of the heatpump and on the difference in temperature between the input (ground) and output (building). The COP is equal to the total amount of thermal energy generated by the heatpump divided by the electrical power used. This COP depends, among others, on the ground (source) and building temperature level. A heatpump operates most efficiently when this difference is not too large. Under the proper circumstances a COP of 4 of higher is achievable. This means that, for every kilowatt of electrical energy, 4 kW of thermal energy is released (heating operation). Of that 4 kW of thermal energy 3 kW is taken from the ground. Compared to an electrical element used for resistance heating the efficiency is 400%, while a conventional High Efficiency gas fired boiler achieves an efficiency of about 125%. The fact that a heatpump works best with a small temperature difference should be taken into account during building design: low temperature system like underfloor or wall heating and cooled ceilings will guarantee best results. Moreover, the higher thermal mass of these heating and cooling systems will favourably affect the thermal characteristics of the building as well. Heat pump selection, with respect to total capacity and capacity steps is essential. 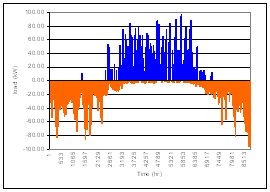 A too large capacity heat pump in relation to building requirements leads to heat pump cycling and destroys efficiency. For a large total capacity, a large borehole heat exchanger is needed as the system needs to operate efficiently. Perhaps a hybrid option with peak demand by gas-boiler is more efficient in the long run. Selecting the correct operating conditions with respect to temperatures and flow regime will enhance performance. COP of the heat pump as well as Seasonal Performance (SPF) can be increased by 15% - 20%. Ground thermal parameters and drilling conditions affect the total number of boreholes, depth and spacing. It impacts efficiency and cost and needs careful consideration. Cooling and heating supplied via a BHE system to the building will reflect on operating efficiency on the heat pump system. Hydraulic design and pump selection reflecting actual operating conditions are essential to the design of groundsource heat pump systems. Poorly or non-designed flow systems usually do not stand in the way of a heatpump running, but will inflict a lifelong penalty of excessive energy usage on the system, or flow related problems when the system is operating at its extremes.